Naturally vivid colored diamonds are extremely rare and beautiful. Known as “fancy” color diamonds, these brightly hued gems come in a rainbow of colors. Only one in every 10,000 diamonds qualifies as a fancy color diamond. These gems have become very popular in recent years and are increasingly sought out for engagement and wedding rings. They offer the benefit of the diamond’s durability with the gorgeous color options of more fragile colored gemstones. 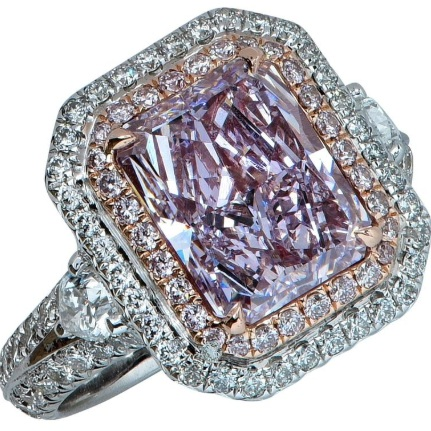 Shown: Purple, pink, and vivid blue fancy color diamond rings. Fancy color diamonds exist in a wide range of colors including yellow, brown, pink, green, blue, purple, orange, rare green, and extremely rare red diamond. The GIA color grading system uses nine grades to distinguish color intensity ranges: Fancy Vivid, Fancy Intense, Fancy Deep, Fancy Dark, Fancy, Fancy Light, Light, Very Light and Faint. The grades assigned are based on the overall effects of the diamond’s hue, tone, and color saturation. Fancy color diamonds are often muted in tone rather than having pure and strong. In general, the stronger the hue, the more valuable the diamond. Brown diamonds are the most common fancy color diamond. The darker shades are marketed as cognac and chocolate diamonds, while the lighter shades are often called champagne diamonds. The most popular brown diamond colors are medium to dark in tone with a warm, golden to reddish appearance. These diamonds usually show a hint of green, yellow, orange, or red undertones. Shown: Vivid yellow and cognac fancy color diamond rings. Yellow diamonds are the second most popular fancy color diamond. Pure natural intense yellow diamonds are often marketed as Canary Diamonds or Canary Yellow Diamonds, but this is not a technical grading term. Black, gray, and “fancy” whites are also considered fancy color diamonds. Black diamonds became popular in the late 1990s when jewelry designers started to pair black diamonds with white diamond pavé. Fancy gray diamonds can range in color from deep gray to those similar to colorless diamonds but with a beautiful metallic blue cast. Fancy whites have a milky white color often show beautiful opalescent flashes of color. Shown: Fancy white (with bright white diamonds), black diamond, and gray diamond rings. Although fancy color diamonds can be cut in the same shapes as any other diamond, most are cut using radiant cut and cushion shapes. Where round brilliant cuts tend to disburse color, radiant cuts tend to enhance color. Gray diamonds, however, are the exception. They are frequently available as round brilliant cut gems. Color is the most important factor with fancy color diamonds. If the face-up color is good, low clarity grades are acceptable. Fancy color diamonds, especially the darker colors, have an advantage over white diamonds in that they tend to hide their inclusions. A fancy color diamond with a low clarity rating may look just as clean to the naked eye as a white diamond of much higher clarity. The rules regarding cost and carat weight carat for colorless diamonds apply to fancy color diamonds. Gems that weigh just under each full carat increment will cost less per carat. For example, a stone weighing 0.90 ct. will cost less per carat than the same quality gem weighing a full 1.0 carat. A stone weighing 1.90 ct. will cost less per carat than an equal quality gem weighing a full 2.0 ct., and so on. Larger carat weights cost more per carat for equal quality smaller stones. Blue, pink, green, and orange fancy color diamonds below a carat weight, however, are still extremely valuable. The prices of fancy colored diamonds are based on the rarity of the specific color, gem color saturation, purity of color (whether the gems have clear, bright colors or if they are clouded), and market availability. Yellow or brown fancy diamonds are often less expensive than white diamonds. When they are Yellow or brown fancy color diamonds that are more vivid may be more expensive. For example, Fancy Intense yellow diamonds are often comparable in cost to white diamonds while Fancy Vivid yellow diamonds can be more expensive. Almost gem can be imitated. Fancy diamond grading is a complex process that requires extremely sophisticated gemstone analysis. To make sure you are getting an authentic fancy color diamond that is exactly as it is being represented, it is crucial to purchase only GIA-certified fancy color diamonds. The GIA (Gemological Institute of America) uses an exacting system for color-grading fancy color diamonds. Their laboratory uses the most technologically advanced equipment and their diamonds graders are considered the world’s finest. Purchasing GIA-certified fancy color diamonds ensures that the quality and complexity of your diamond is as advertised.